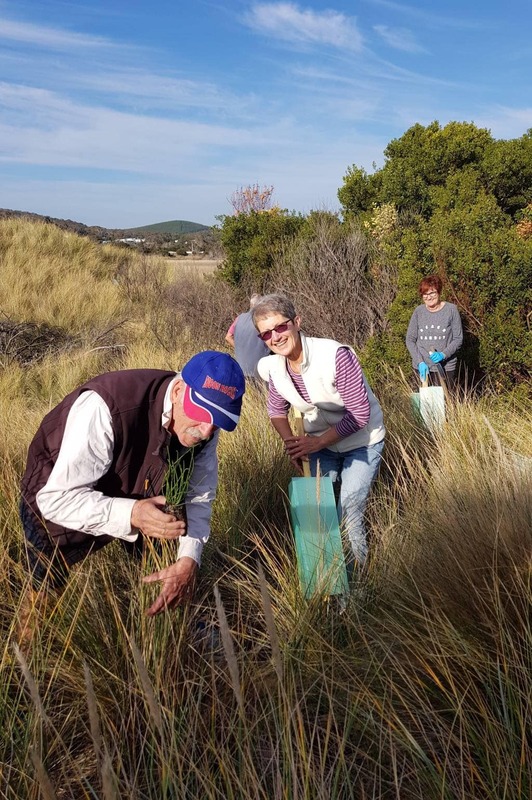 Coastal Action: Members of the Weymouth Progress Association Daryl Bailey, Auriol Von Bertouch and Kathy Hingston planting in the dunes. It’s been two years since a community driven coastal action plan was updated involving progress associations and community landcare groups, Parks and Wildlife Service, Crown Land Services, George Town Council and Tamar NRM. This month, a showcase recognising the contribution of community coastal works that help preserve the natural environment from Greens Beach to Bellingham is to be held on Sunday 24th February. These works include community weed control programs, habitat protection, dealing with coastal erosion, feral animal control, access track maintenance and fire management. The organisers, the George Town Coastal Communities Management Group hope the showcase and community capacity building event will entice new volunteers to become involved. George Town Coastal Communities Management Group chairman, Ian Sauer, said “This is a ground breaking, community driven program to manage coastal regions with the key objective to engender more local ownership of projects.” “The past two years has seen new projects come online, like the Pipers River Erosion Project and we are seeing revitalised coastal communities undertaking working bees on a regular basis.” Mr Sauer said. Presenting on the day is University of Tasmania lecturer and saltmarsh ecologist Dr. Vishnu Prahalad, who is promoting community involvement in mapping saltmarsh across the state and will explain the importance of conserving saltmarsh vegetation communities. The showcase will start at Low Head Penguin Rookery Walk at 9.00 am, stop at various locations along the way, concluding at Weymouth at 3.00 pm. Full details are available on the Tamar NRM website, and the public are invited to register their interest in attending by Emailing: tamarnrm@launceston.tas.gov.au. Phone: 03 6323-3310.